About 3 years ago the Wood Magazine people came out with a “Concrete Truck” in there “construction series”. Somehow our middle grandson saw the plan and since has been asking “pa” to make a concrete truck. I kept explaining to the little bloke “pa” didn’t have a wood lathe to turn the agitator for the back of the truck! The trucks are a mixed of Aussie hardwoods; though the agitators are radiator pine. Nicely made toys; and still PLAYABLE—which makes them GREAT TOYS! Great job. Bet there was one very happy boy. Brilliant job there crowie. Cool scrap salvaging with the use of the flatbed. But, is there a hidden agenda in the two towies??? Maybe a subtle hint to the kids for another ”pa” caller. I’ll bet the little fellows eyes nearly popped out of head. What a great story! These trucks are really nice looking. 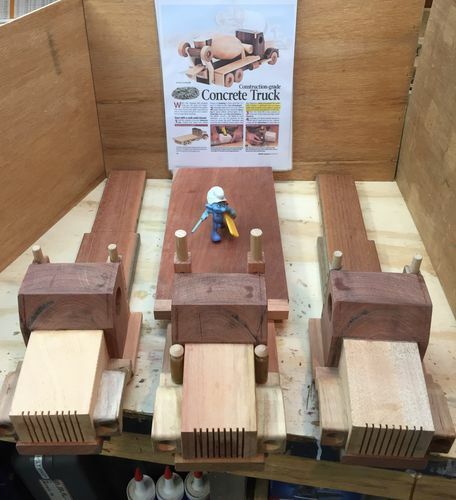 Great detail and the best part….The little guy got his cement truck’s! Great job on the trucks Peter. That should keep the little bloke happy for a while. So, is the lathe next on the to buy list?. Peter….I Dips Me Lid to you….That is very very well made. 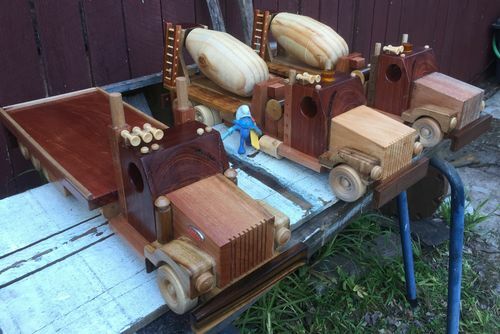 One of the best wooden Toy projects I have ever seen. I can just imagine how happy the little fellow would have been when you presented them to him. A very nice story Peter, and you have bilt some beautifull cars to. Great to hear that where ever it is in the world we can build on each other. Well done and enjoy the smiles you will get. Excellent work. I too usually end up tweaking and changing things when I work from plans. Makes it more interesting. and heavy duty for sure!! !